(Bloomberg) -- India is witnessing its first hostile takeover attempt of a software developer, a move the target says is a “grave threat” to its future. Larsen & Toubro Ltd., Asia’s second-largest engineering firm by value, agreed to buy 20.3 percent of Mindtree Ltd. for about 32.7 billion rupees ($480 million) and plans to acquire a controlling stake for as much as 107.3 billion rupees. V.G. Siddhartha, the largest shareholder in Mindtree through Coffee Day Enterprises and affiliated entities, agreed to sell the original stake for 980 rupees apiece. Mindtree management, including its chief executive officer, say the company’s success lies in being able to build long-term relationships with clients and partners, ties they argue would be jeopardized by the Larsen’s acquisition. Proxy adviser Institutional Investor Advisory Services India Ltd. waded into the debate calling for Mindtree’s independent directors to guide investors on the merits of the offer. 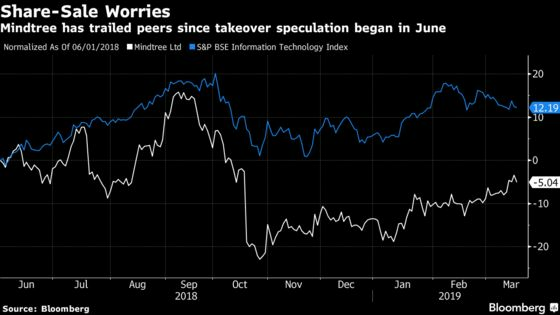 Mindtree, which counts United Technologies Corp. and Dutch phone company Royal KPN NV as its clients, had also attracted interest from private equity firms including Baring Private Equity Asia and KKR & Co., people familiar with the matter said previously. “It is not necessary that Mindtree’s independent directors tow the line with the company’s promoters,” IiAS says in the note. If Mindtree’s leadership and key staff leave taking some clients with them upon the takeover, it could have damaging consequences for the business, IiAS said. The software maker’s shares suffered the biggest loss in a month, dropping 2 percent to 943.3 rupees in Mumbai. Larsen’s stock slid for a second day. The engineering company said it plans to keep Mindtree a listed entity and that the target’s services complement the business of its software unit, Larsen & Toubro Infotech Ltd.
Larsen & Toubro’s Chief Executive Officer S.N. Subrahmanyan said the company “would go out of the way” to make a success of the investment. “Emotionalities have to be overcome going forward,” he said at a briefing in Mumbai on Tuesdsay. Still, Mindtree insisted the transaction would destroy value. The company has reached out to Nalanda Capital, its largest institutional shareholder, and the investor is “unequivocally in support” of the software developer, Chief Executive Officer Rostow Ravanan told reporters in Bengaluru. Nalanda funds own 10.6 percent of Mindtree. Mindtree last week said it will consider buying back shares, in a bid to deter any buyers. Co-founder Subroto Bagchi, who also signed Tuesday’s management statement, said in a tweet Sunday he’s returning to the company to protect it from being taken over.